Right-hander Claral Gillenwater spent most of the 1920s pitching in mid-level minor leagues without much sustained success. His brief major-league career was no different. Given a late-season tryout by the Chicago White Sox in 1923, Gillenwater lasted barely three weeks on the roster. But before he was released, Gillenwater managed a performance of true artistry: a complete-game, four-hit shutout of the Boston Red Sox. For the remainder of his life – most of which he spent as a barber – Gillenwater would have fond memories of that one shining afternoon when he had been a major-league pitching master. Claral Lewis Gillenwater was born in Sims, Indiana, on May 20, 1900, the younger of two sons born to barber Robert Gillenwater (1870-1936) and his first wife, the former Nellie Albright (born 1879).1 By 1910, his mother was deceased and Claral and his father had moved to Beaver, Ohio, where Claral attended school through the eighth grade. His older brother, Ora, died during the influenza pandemic of 1919, but by then Robert Gillenwater’s remarriage had introduced five new children into the family.2 All the while, Claral was living at home and apprenticed in his father’s barbershop. As a teenager, Claral, tall and slim (6-feet-1½, but then far lighter than his 187-pound major-league playing weight), played amateur and semipro baseball in and around the latest Gillenwater homestead in Marion, Ohio. Although a good righty batter, Claral’s forte was pitching, in which he befuddled the local competition with a Carl Mays-like submarine delivery. In spring 1920, Claral entered the professional ranks, signing a contract with the Peoria Tractors of the Class B Three-I League. During that campaign, the local press took to calling him Claude Gillenwater,3 the first of the misnomers that the Fourth Estate would attach to him. Over the next eight years, he would also be called Clarel Gillenwater, Claren Gillenwater, Alton Gillenwater, Clare Gillenwater, Allen Gillenwater, Clyde Gillenwater, Al Gillenwater, Claud Gillenwater, and Chief Gillenwater – but, strangely, never once Claral Gillenwater, his actual name.4 By whatever name, Gillenwater made a respectable first impression, going 13-15 for a sixth-place (67-71) Peoria club. In April 1921 Gillenwater reported to Peoria’s spring camp,,5 where Tractors manager Bill Jackson expressed “a great deal of confidence in Gillenwater’s ability to breeze through the circuit with his submarine ball.”6 But by May, indifferent early work had led to the assignment of his contract to the Saginaw Aces of the lower Class B Michigan-Ontario League.7 Going 17-14 with a league-leading 157 strikeouts for a mediocre (57-62) club, Claren Gillenwater began to attract some attention, particularly after he posted dominant complete-game victories in both ends of an August 12 doubleheader against Port Huron. Soon, major-league scouts, including Wild Bill Donovan, arrived in Saginaw to assess the young prospect.8 Also taking notice of Gillenwater was Rachel Phillips, a 22-year-old clerk at a Saginaw dye works. Claral and Rachel would begin their 56-year marriage the following February. For the 1921 season, the San Francisco Seals of the Double-A Pacific Coast League had assigned pitcher Harry Shriver to Saginaw, taking an option on anyone else on the Aces’ roster in exchange. In September the Seals exercised that option, selecting pitcher Alton Gillenwater.9 The new acquisition made an impressive late-season debut with San Francisco, hurling a complete-game five-hitter in a tough 2-1 loss to Seattle. He also pitched well in three short relief stints, finishing his brief PCL campaign at 0-1 with a 2.25 ERA in 12 innings pitched. Gillenwater was then assigned to the Mission Club in the California Winter League, a short-season circuit that engaged many major-league players. On October 21 Missions manager Harry Heilmann sent Gillenwater to the mound against a Los Angeles Angels team that featured Ty Cobb. Gillenwater surrendered two singles to Cobb, but held the rest of the lineup in check, posting a six-hit, 3-0 shutout victory. San Francisco Examiner sportswriter Jack James was duly impressed, informing readers that Winter League play had demonstrated that the Seals “are possessed of a mighty capable young pitcher … Mr. Claude Gillenwater.”10 Back in Saginaw, the local press was bursting with pride. “Gillenwater Held As Find Of Season,” headlined the Saginaw News, quoting Heilmann as saying, “I think Gillenwater is one of the finest looking prospects I ever looked at,” while Seals catchers Sam Agnew and Arch Yelle were said to have predicted that “young Gillenwater will be the talk of the league next season.”11 Pitching for the Missions into early December, Gillenwater went 6-4 in 13 games,12 and then returned to his home in Saginaw. Back in familiar surroundings, Claren Gillenwater exhibited flashes of previous form – hurling three shutouts in a two-week period – but pitched inconsistently. After a dismal relief outing in a 12-11 loss to Kitchener had lowered his record to 5-7, San Francisco, which still held the contract rights to the young pitcher, sent him to the Evansville Evas of the Three-I League. Joining his new club on August 10, Gillenwater shut out Rockford on five hits the following day, making him look “like a fixture” on the Evansville staff.17 But Gillenwater would only get intermittent work for the remainder of the season, going 4-3 for the Evas in spot starter/relief duty. 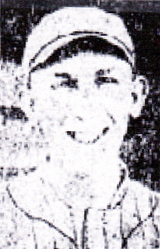 But still only 22 years old, Clyde Gillenwater would likely be recalled by San Francisco for the 1923 season, the San Diego Union predicted.18 Before the season started, however, the Seals sold the Gillenwater contract to the Nashville Volunteers of the Class A Southern Association. Although he seemed on the skids, Gillenwater got another chance in the same Three-I League where he had begun his professional career, signing with the Terre Haute Tots for the 1925 season. Alternating between spot starts and relief work, he turned in arguably his best season, going 15-8 with a 4.06 ERA in 215 innings pitched for the second-place (81-54) Tots. Gillenwater also helped the club with the stick, batting .330 and occasionally filling in at second base. He was back with Terre Haute the following season, but got off slowly. In July Gillenwater was shipped to the Three-I League rival Quincy Red Birds, where he went 4-5 with an unsightly 10.29 ERA in 63 innings. Back home in Michigan after the season, Gillenwater also pitched for Bay City in the Fall Three-I-Michigan League. In January 1927 the Evansville Courier and Post reported that “among the dozen or so candidates” under contract with the Evas for the 1927 season was “Mr. Claude Gillenwater, pitcher of long proportions who has hurled bad, good, and better baseball for several clubs in the Tri-Orb during a stretch of eight or less years. … It seems that Gillenwater is an ‘in’ and ‘outer’ and that he is ‘in’ on the odd seasons and ‘out’ on the even ones. In 1923 he had a great season … and again in 1925. He is due in 1927.”28 Unfortunately, form did not hold -- at least during the time that Gillenwater spent in Evansville. He pitched decently in spots, but was released after a 6-1 loss to Springfield in early June.29 Gillenwater then slipped down to the Class C Middle Atlantic League, where he posted a sparkling 13-3 log, with a league-leading 1.66 ERA for the Wheeling Stogies. On January 2, 1928, Claral Gillenwater’s ballplaying future was altered by an event on the domestic front: the birth of daughter Gloria Anne, his only child. He returned to Wheeling for the 1928 season, and went 16 innings in the season opener.30 But he did not remain long, departing for home after posting a 4-3 record in 11 games. Later that summer and in ensuing years, Gillenwater sometimes played on weekends for semipro teams in and around Clare County, Michigan. But his professional baseball days were over. For the rest of his working life, Gillenwater would earn his living as a barber in Saginaw. Gillenwater spent the next 50 years in the obscurity of private life. From the fragmentary evidence available, it appears that he led an unremarkable existence, living in Saginaw with wife Rachel and daughter Gloria, reportedly the Jitterbug Queen of Clare County in 1949. Claral, as he was called by family and friends, remained in town as proprietor of Frederick’s Barber Shop for decades, often devoting his leisure time to fishing and hunting.31 But despite the modest rewards of his playing career, he never regretted having tried his hand at professional baseball and would have done it all over again if given the chance, according to the questionnaire that Gillenwater returned to the Hall of Fame in 1960. After retiring, he and Rachel moved to a trailer park in Ruskin, Florida, to be close to Gloria and her family. On February 27, 1978, Gillenwater died in Bradenton, aged 77. 32 His ashes were subsequently returned to Saginaw and interred in Forest Lawn Cemetery. About a month thereafter, The Sporting News reported the death of former Chicago White Sox and minor-league pitcher Claral Lewis Gillenwater33 – the first and only time that a baseball newspaper article got the name right. The writer is indebted to Nancy Griffith for her help in reconstructing the playing career of Claral Gillenwater. 1 The biographical information contained herein is derived mainly from US Census and local directory data accessed via ancestry.com. Gillenwater’s baseball career was reconstructed through use of Baseball-Reference.com, newspaper reportage reviewed by the writer, and the Claral Gillenwater file (with transaction card and completed player questionnaire) maintained at the Giamatti Research Center, National Baseball Hall of Fame and Museum, Cooperstown, New York. 2 Robert Gillenwater’s second wife, Myrtle May McCammon (1889-1919), also had a daughter by a prior marriage, while Robert’s third wife, Stella Shoemaker Taylor (1886-1954), later gave Claral three additional half-siblings. Claral’s extended family, however, did not include Carden Gillenwater, an outfielder with various National League clubs during the 1940s. 3 See e.g., the Rockford (Illinois) Morning Star, August 30, 1920, taking delight in the 2-1 Rockford Rox defeat of “Claude Gillenwater and his submarine ball.” Why the press converted Claral’s unusual first name to Claude is unknown, but note should probably be taken of the fact that there was a fairly prominent 1920s stage and silent film actor named Claude Gillenwater. 4 The various different Gillenwaters seemingly pitching during the 1920 has produced multiple entries in Baseball-Reference. B-R has both major and minor league entries for Claral Gillenwater; a different minor-league entry for Claude Gillenwater, and four separate minor-league entries for Unknown Gillenwater. All the pitching records memorialized in Baseball-Reference belong to the same man: Claral Lewis Gillenwater. 5 Evansville (Indiana) Courier and Press, April 13, 1921. 6 Evansville Courier and Press, April 20, 1921. 7 The Aces obtained Gillenwater from Peoria under a 30-day option, with the right to purchase, according to the Saginaw News, May 12, 1921. See also, Rockford Morning Star, May 11, 1912, re the transfer of Gillenwater to Saginaw. 8 Saginaw News, August 20, 1921; Bay City (Michigan) Times, August 21, 1921. 9 Seattle Daily Times, September 3, 1921. See also Twin Falls (Idaho) News, September 14, 1921, which identified the new Seals pitcher from Saginaw as Allen Gillenwater, and the Peoria Star, September 15, 1921, which declared that Saginaw had sold Clare Gillenwater to San Francisco. 10 San Francisco Examiner, October 22, 1921. 11 Saginaw News, October 31, 1921. 12 Baseball-Reference does not provide statistics for the California Winter League. The 1921 Gillenwater record of 6-4 in 13 games was extracted from published box scores and may be incomplete. 13 As reported in the Salt Lake Telegram, January 19, 1922, and elsewhere. 14 Portland Oregonian, March 13, 1922. 15 As conveyed via the Riverside (California) Daily Press, April 3, 1922. 16 Portland Oregonian, June 4, 1922. 17 Evansville Courier and Press, August 11, 1922. 18 San Diego Union, November 25, 1922. 19 Atlanta Constitution, June 10, 1923. 20 As reported in the Cleveland Plain Dealer, Chicago Tribune, and Washington Post, August 16, 1923. 21 Chicago Tribune, August 21, 1920. 22 Boston Herald, August 26, 1923. 23 Chicago Tribune, August 26, 1923. 24 Washington Post, September 9, 1923. Associated Press member papers identified the demoted hurler as Clyde Gillenwater. See e.g., Canton (Ohio) Repository, September 9, 1923. 25 See “The Mystery of Gillenwater,” The Sporting News, September 20, 1923. 26 Richmond Times, March 27, 1924. A recently published history of baseball in Norfolk identifies him as C.L. Gillenwater. See Peter C. Stewart, Early Professional Baseball in Hampton Roads: A History, 1884-1928 (Jefferson, North Carolina: McFarland, 2010), 182. 27 Baseball-Reference provides an 8-18 record in 47 games pitched entirely with Petersburg for one of the Unknown Gillenwaters, but perusal of 1924 box scores establishes that Gillenwater actually split the season between Norfolk and Petersburg. See also, Stewart, 187. 28 Evansville Courier and Press, January 27, 1927. 29 Baseball-Reference has no record of a Gillenwater pitching for Evansville in 1927. The writer’s review of published box scores provides Gillenwater with a 2-1 record in ten games pitched for the Evas, but again, this may be an incomplete tally. 30 Charleroi (Pennsylvania) Mail, May 12, 1928. 31 A 1954 photo of Claral and half-brother John Gillenwater displaying their fishing catch is viewable at the Gillenwater family tree site posted on Ancestry.com. 32 See Gillenwater’s obituary in the Tampa Tribune, February 28, 1978. 33 The Sporting News, April 1, 1978.